My mother sent this picture from Norway. Snow, winter, family, winter sports on TV: it all seems very far away when it is a sweaty 32C here in Accra. The harmattan seems to be over, the skies are clearer and it is a relief to not have the dust creeping in. I am still househunting with current flatmates, there are possibilities for potential 3-bedroom flats (though so expensive….). I never thought I’d be flat-sharing again at my age, but it does saves money, which will go towards flights back to see my husband. And the flatmates are very nice, so yesterday I made waffles for breakfast. Most of my things are still packed away in boxes, pending the next house move in February, but I did excavate my Norwegian waffle iron. Bare essentials! It was also a pre-Accra gift from my mother. As she says, you can find eggs, flour and milk most places in the world, which means you can make warm cardamon-scented waffles like these, and that makes a temporary place feel more like home. Waffles are a Norwegian tradition. Not a week goes by in a Norwegian home without a waffle being eaten. Unlike the Belgium waffles, Norwegian waffles are large, soft and fluffy and fit pefectly folded in your hand. Soured milk is a usual ingredient however, it can be replaced by fresh milk. Cardamum, a common spice used in Norway, is not typically used in basic recipes but can add extra flavour. The toppings are simple but yummy: slices of Norwegian brown cheese, a spread of sour cream and jam or just a sprinkling of sugar. Whisk eggs and milk. Then whisk in the dry ingredents. Finally, add the melted butter (cool a bit before adding to batter). Let batter rest 30 minutes at least. I made mine the night before as it was for breakfast the next day, and left it in the fridge. You may need to add more flour or more milk until the batter consistency is about right. Heat your waffle iron, it may need a bit of butter to avoid sticking, but these did not. My waffle iron beeps when they are done, which makes it very easy. Otherwise, let them cook until golden (but do not peek too early or they will collapse), then flick them out with a knife (without scratching the iron.) Let them cool slightly on a cooking rack. Serve the waffles cut into single waffle hearts or double ones, nicely presented on a plate, with jam for each person to add as needed. I do have a precious block of Norwegian brown cheese in the fridge, and will break that out for future waffles. Normally I’d make at least a litre of waffle batter, so there are leftovers, and I might try this Tine waffle recipe doubled next time. Waffles do bring happiness! This entry was posted in food and tagged living in Accra, nice cup of tea, waffles on January 21, 2018 by krumkaker. Between visitors, a quick trip to Norway and fighting a cold, my vegetable drawer has been neglected. Time to stock up on pumpkin and chestnuts, leeks and potatoes, and to use up my last two sweet potatoes. 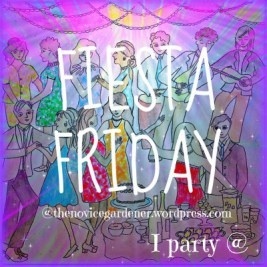 Fiesta Friday was passing me by, but how could I miss the big birthday shebang? Happy birthday Angie at The Novice Gardener! 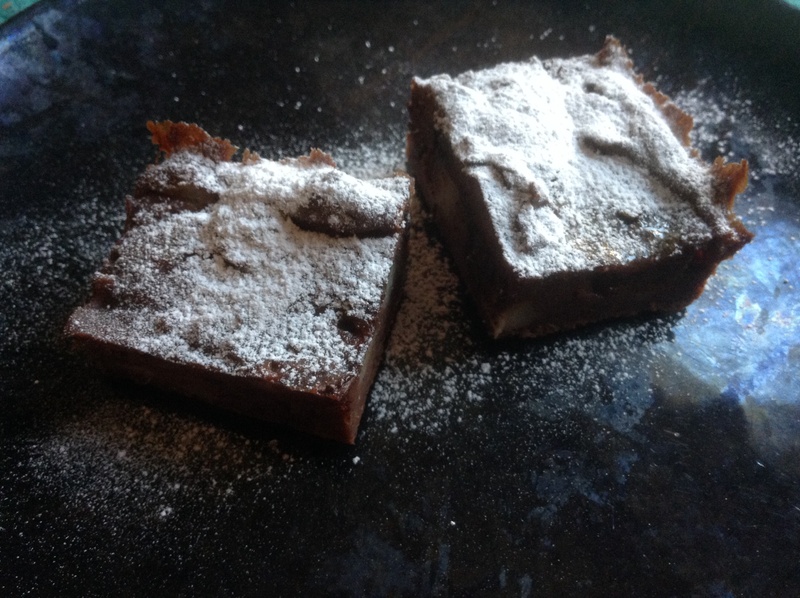 So I made these brownies today, dark and sticky, in honour of her birthday fiesta. Whisk the eggs, then add honey, oil and vanilla extract. Add dry ingredients, then add chopped chocolate, salt and butterscotch bits, if using them. Do not overmix. Line a small baking tray (20×30 cm) with baking parchment. Bake at 180C for 25 minutes, until dry on top but still squidgy inside. Cool, and dust with a little icing sugar before serving. Notes: If you do not have leftover sweet potato, cook your sweet potato (oven, microwave or steamed on stovetop). I peeled and steamed these, then mashed them. I was aiming for a very dark kladdkaka texture, the gooey Swedish chocolate cake. It is not very sweet. You might want this sweeter, just add more honey or sugar for that. I had some chestnut flour, so used that, but plain flour would work too. I might try this again with a little chili pepper, or black pepper. Very nice with a cup of tea and last week’s Downton Abbey. Happy FF39 to all! 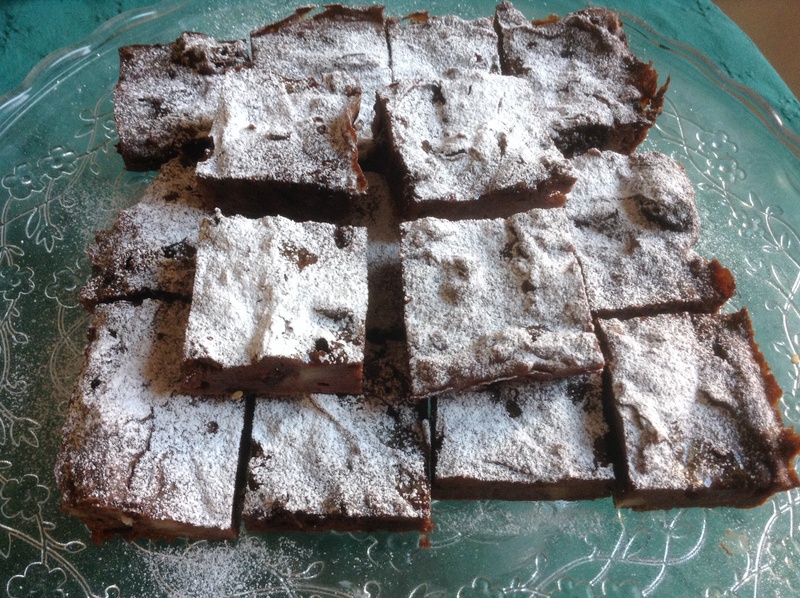 This entry was posted in baking, food and tagged brownies, chestnut flour, Fiesta Friday, nice cup of tea, sweet potato on October 26, 2014 by krumkaker. Already Friday, my goodness! After various rounds of houseguests, and with holidays coming soon, we emptied out the fridge of all the perishables, and this cake was one of the results. I am still testing baking with less sugar and butter, which sometimes works well. Sometimes it is less successful, which is usually signalled by my husband politely saying “It tastes…… healthy.” I made a really disastrous wholewheat zucchini lemon cake last weekend, that recipe needs more work. But when fruit or berries are included, the result is usually quite nice. 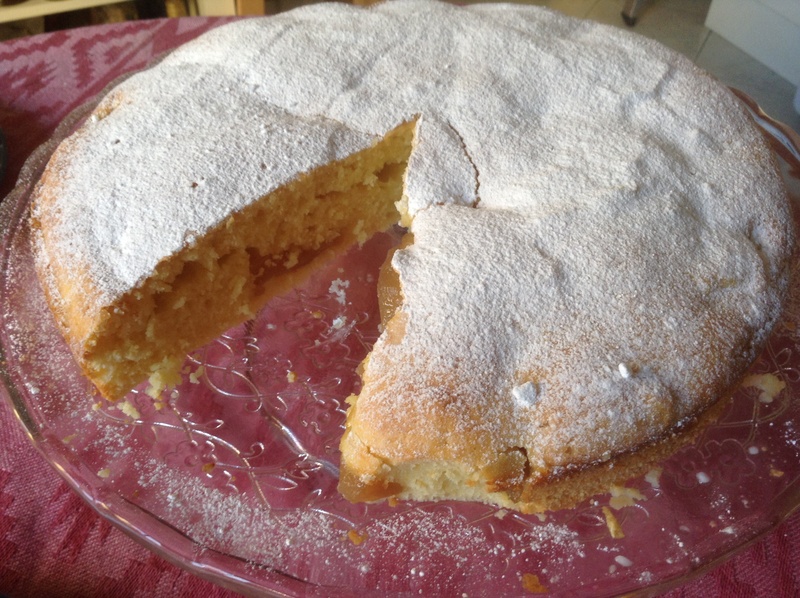 In Italy you might have a cake like this for breakfast, but we had it with a nice cup of tea. So I am bringing it to Fiesta Friday 30, with thanks to the hosts. Now, off to explore the other delicious contributions…. A very good weekend to all! Heat oven to 190C. Separate the eggs. In one bowl, beat the eggwhites stiff. In a second bowl, beat the four egg yolks with the sugar, then beat in the ricotta. Add zest and juice of one lemon. Stir in flour and baking powder, then fold in beaten eggwhites. Prepare a 24 cm springform tin: line it with baking parchment. Spoon in half the batter. Add a layer of thinly sliced pears, then top with rest of batter. Even it out, and pop into oven. Bake at 190C for 45 minutes or so, until lightly golden. Cool, dust with icing sugar and serve. Notes: this was baked for 30 min at 180C and still looked quite pale, so I upped the temperature to 190C and baked it another 15 min. 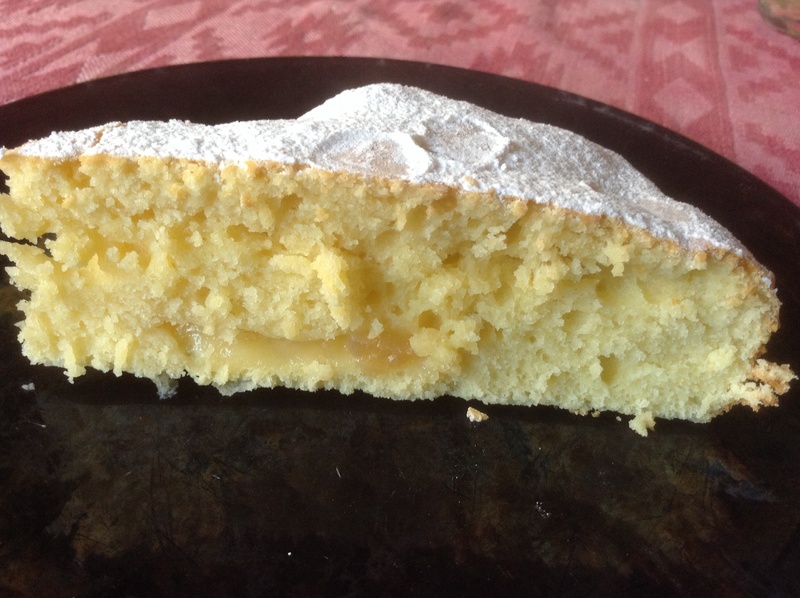 This entry was posted in baking, food, fruit and tagged cake, Fiesta Friday, nice cup of tea, pears, ricotta on August 22, 2014 by krumkaker.